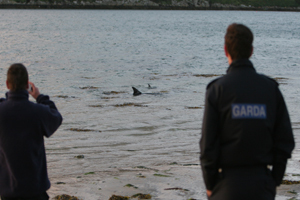 17th Aug 2008 IWDG recieved calls on Saturday afternoon that two dolphins were repeatedly live-stranding at the Cockle Beach in Crookhaven West Cork. Despite at least 3-4 attempts by locals and holiday makers to bring the dolphins out to deeper water, the dolphins continued to live-strand. On arriving at the scene it was clear that the dolphins, were a common dolphin mother and juvenile/calf pair, and that of the two, the mother was the one with the greatest difficulty in swimming. Her movement was laboured and quite lethargic and we decided to let them live-strand, without interference. By around 20:30 the two were stranded on the sandy beach on a falling tide, and IWDG were on hand to offer interpretation to the public and to explain why attempting yet another refloat wasn't an option. The Juv/calf at 150cm still showed signs of neo-natal folds, and would most likely still have been dependent on its mother. Bantry Garda kept a presence thoughout the day to ensure that the public's safety remained a priority. We contacted local Schull vet and IWDG member Tim O' Leary, who made it to the site despite a hectic schedule that evening, and after an initial inspection and discussion with the "care team" it was agreed that euthanazia was the best course of action. Shortly after midnight a lethal injection of 100ml of Euthatol was administered and suffering of both dolphins was over within seconds. 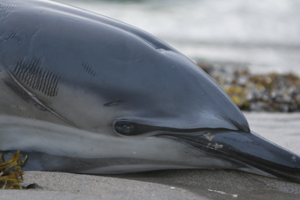 The IWDG co-ordinate the Irish Cetacean Stranding Scheme, and appreciate being contacted in the event of all stranding events (dead or alive). In the case of live strandings it is particularly important that we are contacted as soon as possible, as the earlier we can get onsite, the greater the options are. In this instance by the time we arrived there were two remaining options: euthanasia or to allow the dolphins expire naturally on the beach (which could have prolonged their suffering for many more hours). Neither are options we relish. Common dolphins have been reported in increasing numbers in recent weeks by whale watchers from many land-based sites off the south and southwest coasts. 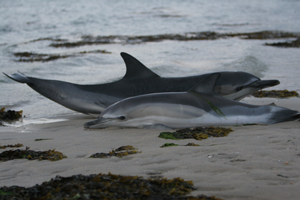 They are by far the most frequently reported dolphin species in Irish inshore waters. IWDG would like to thank Valentia Coastguard and members of the public for contacting the emergency services and the IWDG. We are particularly grateful to Bantry Garda Martin Bohane, and to Clive Seawright and Steve Roffe who remained onsite till the very end at around 01:00AM. To Vet Tim O' Leary and his colleague for volunteering their time and expertise. Lastly to the local farmer and family for the flask of tea and biscuits.